Taipei, March 25 (CNA) Environmental authorities and the New Taipei City government are running out of time to prevent major leaks of toxic substances from a container ship that ran aground off Taiwan's northern coast. The authorities took emergency measures Friday to limit the ecological toll of leaks from the vessel on nearby areas, but rough seas and bad weather have prevented them from pumping out heavy oil and fuel from the ship itself, which may be on the verge of capsizing. 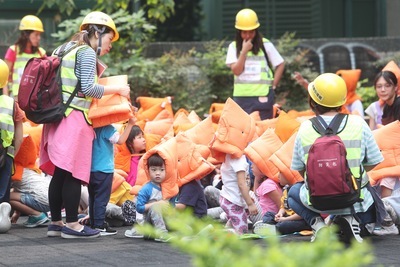 Over 100 people were sent to the coastal area of Shimen District in New Taipei on Friday to help clean shorelines polluted by oil leaks from the "Teh Shiang Taipei" container ship, which lost power in rough seas on March 10 and ran aground in waters off Shimen. The local government also closed Shimen fishing port in Shimen District on Friday after closing the Caoli fishing port in the same district a day earlier, hoping to prevent leaked fuel and oil from damaging port facilities and hurt the livelihoods of local fishermen. But work on salvaging the stranded ship and pumping out its fuel has been slow because there have only been six days when the sea was calm enough for the pumping operation to proceed, according to the Cabinet-level Environmental Protection Administration (EPA). Authorities have not been able to work on the stranded ship since March 23 because of rough seas and do not expect to be able to resume operations until next Monday. That could be a real problem, the EPA warned, because the ship, which is stuck in a reef off the northern coast, began showing cracks on March 24 after several days of being pounded by big waves and started to leak its diesel fuel and heavy oil into the sea. The cracks expanded, causing the ship to nearly break apart, and there are major concerns that the big vessel could capsize at any time, potentially sparking a biological disaster. The vessel still contains around 242 cubic meters of diesel fuel, 37.5 cubic meters of lubricants, 35 cubic meters of waste oils, and 614 containers, the EPA said in press release Thursday. Of the hundreds of containers on board, nine contain highly hazardous chemicals, including toluene, potassium perchlorate, corrosive cleaning products and flammable lubricants. "If the ship capsizes, the oils could be discharged and the cargo and fuel could fall into the sea, affecting local shorelines and the marine environment," the EPA warned. Oil leaks from ships like the Teh Shiang Taipei container freighter are rare in Taiwan, said Sheng Chien-chuan (沈建全), a marine environmental engineering professor at National Kaohsiung Marine University, on Friday. Once the marine biological system is damaged by heavy oil, however, it will take two to three years to recover, Sheng said.